Generally, when you're at a business event, the objective is to foster a better relationship with the other party. Keep this in mind when you prepare topics of conversation. First, identify how you want to nurture or improve the relationships of the people in attendance. Is it to build trust or thank them for their business? Is the event with co-workers, and is it time to inspire them or congratulate them? Is this meal part of a job interview? Do take a moment to understand what's needed for the event to be successful and achieve its purpose. Second, think about possible topics of conversation. (By the way, if you don't usually prepare topics for conversation, you should.) If you are meeting a potential client for lunch, try to find out or remind yourself what their interests are beforehand. Do they love football? Talk about the upcoming game or ask who their favorite player is. If you aren't an expert on their interests, this will give you time to research beforehand to have an intelligent conversation, as opposed to Googling "spelunking" in the restaurant restroom. Take a few minutes to recall recent conversations. Look the person up on LinkedIn. Talk to a co-worker who knows the person well. Do your due diligence in advance. Action tip: Take five minutes to consider the purpose of your next event. Prepare five possible topics of conversation for your next dining event. Pick neutral topics, avoiding religion and politics. This doesn't mean you should dominate the conversation, but if you are prepared, it will help you to feel more confident and knowledgeable. Before the meal, shake hands with anyone already sitting at the table. If necessary, introduce yourself using your full name. Be sure to remain standing until your host sits. Once you sit down, place your napkin on your lap only after everyone else is seated and your host has moved his or her napkin. If someone arrives to the table after you do, it's polite to stand up to greet them. It's always a good idea to put your phone on silent and leave it in your pocket or in a purse/bag. If you are expecting an important call, turn your phone to vibrate and excuse yourself from the table to take the call outside. Place your napkin in your lap immediately upon seating. If there is a host or hostess, do wait for them to take their napkin from the table and place it on their lap. Please, please don't tuck your napkin into your collar, between the buttons of your shirt or in your belt. If you need to leave the table for a few moments, put your napkin on your chair. When you are finished with your meal and preparing to leave, loosely fold and place your napkin on the table. Don't use your knife to cut your rolls during a business meal. Break your roll in half and tear off one piece at a time. If using butter, place some on your butter dish and butter each small piece as you are ready to eat it. If there is a bread basket, pass it to your right. Be sure not to take the last piece without asking if any other table guests would like it. If a guest asks for salt and pepper, always pass both together. Follow your host's lead - if they're first in line to order, choose something similar to what they order. For example, if they opt for a salad, try not to go for the prime rib. If the host isn't first in line to order, then ask for his/her recommendation. And of course, don't order the most expensive thing on the menu. Order foods that are easy to eat, such as chicken, fish or salads. Avoid dishes with a messy reputation such as spaghetti, ribs or a greasy burger (as hard as that may be to resist!). Imagine sitting down at the table during your yearly corporate meal, and seeing three forks, two knives and three different glasses at your place setting. Would you know what to do? Your table manners essentially reflect who you are in the business world at these events, so it's important to get it right. You also don't want to become anxious at the event because you don't know what to do. Knowing in advance will help you remain calm and focused on the task at hand, not which fork to use. Food is placed to the left of the dinner plate. Your bread or salad or any other food dish should be placed to the left of your dinner plate. 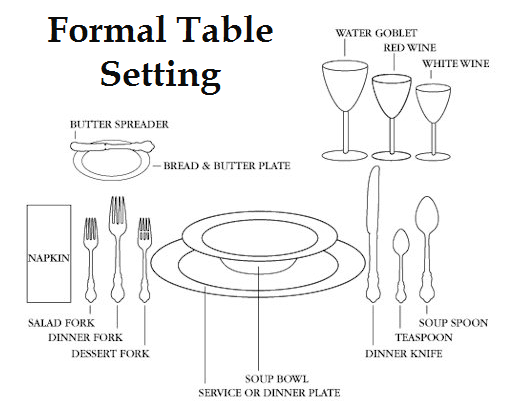 Similarly, drinks are placed to the right of the dinner plate. Any glass or drink will be placed to the right of the dinner plate. Follow these tips so you don't accidentally take a sip of your neighbor's water! When it comes to utensils, picture the word "FORKS." The order (left to right) is F for fork, O for plate (the shape! ), K for knives and S for spoons. Your fork goes to the left of your dinner plate; your knife and spoon go to the right. Knife blades always face the plate and the napkin should be placed to the left of the fork. If you drop something on the floor, such as your napkin or knife, leave it on the floor and let the waiter take care of it. When preparing to order your meal, it's fine to ask the waiter about one or two dishes (especially if you have a food restriction) but don't ask them to explain everything on the menu. You may appear to be too picky or indecisive and may annoy the other guests. Don't add salt or pepper to you food until you've taken a bite. Try a little of everything on your plate unless you have a food allergy. You could come across as unsophisticated (and juvenile) if you eat only your steak and potatoes and ignore your veggies. If the food served is not to your liking, it is polite to at least attempt to eat a small amount of it. Additionally, don't over indulge or ask to finish anyone else's food. Cut only enough food for the next mouthful. Eat in small bites and slowly. Do not "play with" your food or utensils. Never wave or point silverware and don't hold food on your fork or spoon while talking. Your mom was right - keep your elbows off the table and don't talk with food in your mouth. You are not the waiter. Be polite and let the wait staff serve you and thank them when appropriate. To signal you are finished, you can place your fork and knife on your plate. "You are there for business, not for the leftovers. Dogies bags are okay for family or social dinners but not during professional occasions." "If you did the inviting, you are the host, and you should pay the bill, regardless of gender. What if a male guest wants to pay? A woman does have some choices. She can say, 'Oh, it's not me; it is the firm that is paying.' Or she can excuse herself from the table and pay the bill away from the guests. This option works for men as well, and it is a very refined way to pay a bill." If you are the guest, kindly thank the host for the meal, shake hands before you leave and maintain good eye contact. Etiquette author Barbara Pachter says you need to be the one talking as you're making the exit. "Remember to leave when you are talking. At that point, you are in control, and it is a much smoother exit." You should also have "exit lines" prepared in case you need to leave a conversation. You can say "Nice to meet you" or "Nice talking to you" or "See you next week at the meeting." You can also excuse yourself for a bathroom break, to get food, or say you wanted to catch someone before they leave. If you simply need to leave the table during the meal but plan to return, place your napkin on your chair and push your chair back under the table. There is no need to announce where you are going or what you will be doing when you get there. You should send thank you notes within 24 hours of the meal and send separate notes to everyone you want to thank. Pacter says, "Before you choose between email and handwritten notes, consider that regular mail may take several days to reach its destination while email arrives immediately. The time difference can be important right after a job interview if a hiring decision is being made quickly." You can also send an email immediately and follow it up with a mailed note.